Uncle Sherman’s dish is a classic Cantonese comfort stir-fry. I remember watching him cook it for “The Family Wok-a-thon” story in The Breath of a Wok—the broccoli and cauliflower were meticulously cut into small pieces so that they would stir-fry quickly and evenly. I noticed that he didn’t need to measure ingredients precisely—he added a tiny spoonful of the bean sauce while stir-frying the chicken, then a little more when he added the vegetables. 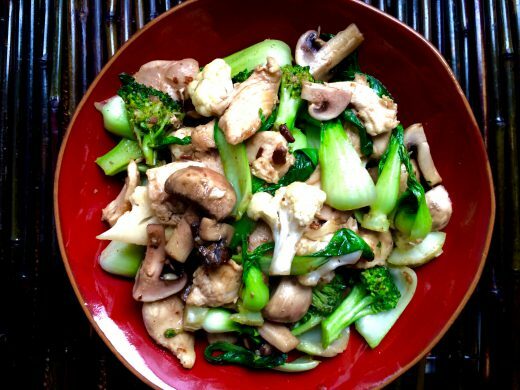 He swirled in a splash of cold water after stir-frying the broccoli and cauliflower, then repeated this once the bok choy and mushrooms were in the wok. This stir-fry is so easy. 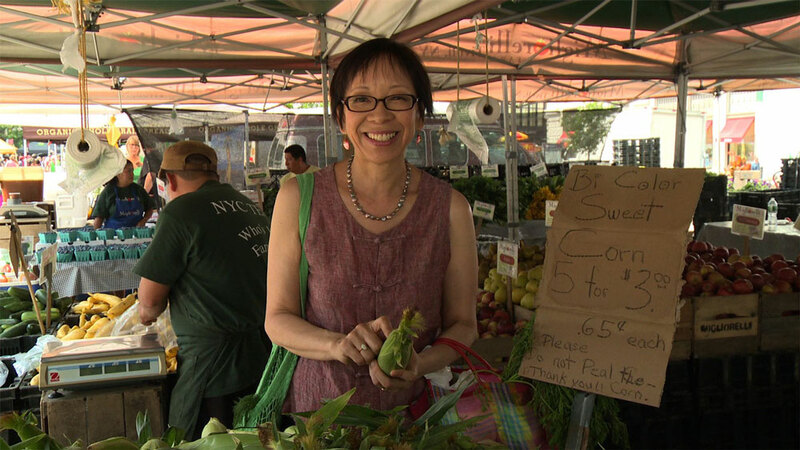 You can vary the vegetables according to what’s in season. Instead of water substitute chicken broth for a richer-tasting dish. And if you want a little heat, add a pinch of red pepper flakes when the chicken is just starting to brown. In 1939, when Uncle Sherman was 12 years old, his mother taught him how to cook. Everyone had to work in those days, and it was important that the children help out. Every evening Uncle Sherman and his older brother cooked a simple dinner for the rest of the family, usually a stir-fry or a steamed dish with a soup and rice. Uncle Sherman recalls that his parents didn’t have a wok. He saw woks in restaurants and stores in Chinatown, but his home kitchen was too small to accommodate such a big, wide pan. 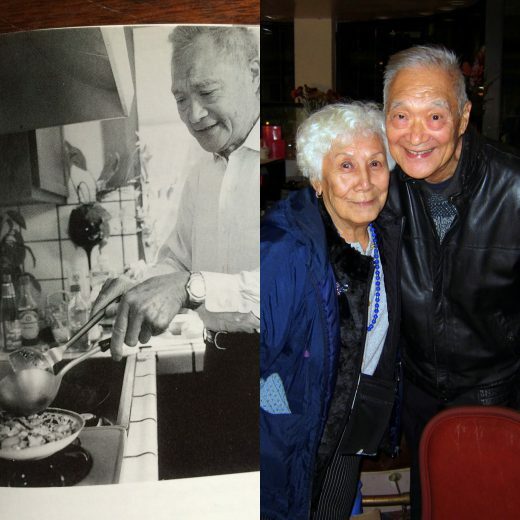 When Uncle Sherman and Auntie Frances married in 1953, they bought their first wok, a traditional carbon-steel pan that they still have 63 years later. Auntie Frances says that most pans are too heavy, but they can still handle the wok. Sadly, neither of their children have woks. It doesn’t surprise me. 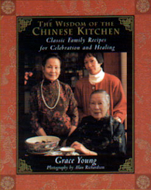 Many Chinese Americans don’t have a strong connection to Chinese cooking. As for me, I feel lucky Breath gave me the opportunity to watch Uncle Sherman stir-fry his Home-Style Chicken and Vegetables. I’m impressed Uncle Sherman is continues to fire up his wok. 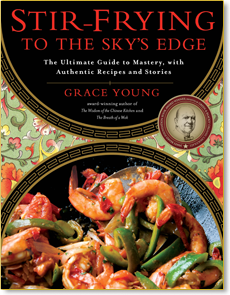 Bravo to 77 years of wokking! 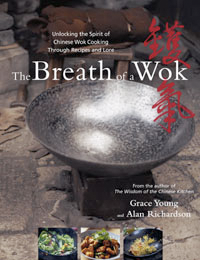 The black and white image of Uncle Sherman is taken by Alan Richardson for “The Breath of a Wok.” The color image of Auntie Frances and Uncle Sherman was taken in 2015 by John Wong.